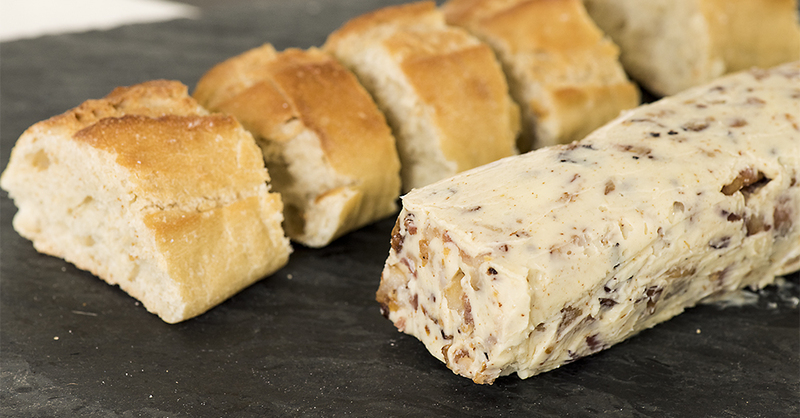 This Bacon Butter Makes Everything Taste 100 Times Better! We all know that butter makes everything better, but bacon butter?! It’s so simple, yet we’d never thought of it until a recent trip to a local restaurant, where our steaks were served with this buttery goodness melting on top – we immediately knew we had to create our own. It’s loaded up with savory flavors, including onions and worcestershire sauce, and of course a ton of crispy bacon! It really is the best way to finish off steaks, burgers, and even grilled or roasted veggies. If you whip up a big batch, you can easily pull a few pats out of the freezer whenever you need them, which, if you’re anything like us, will be often! In a medium skillet, saute bacon over medium heat until mostly cooked. Add onion and continue to saute until bacon is crispy and onion is softened. Drain excess grease and set aside to cool slightly. In a medium mixing bowl, add softened butter, bacon-onion mixture,worcestershire sauce, and pepper. Cream together with a hand mixer or two forks until thoroughly mixed. Transfer butter to a large piece of plastic wrap and form it into a long log. Wrap butter tightly in plastic wrap, twisting the edges to seal. Refrigerate or freeze until chilled and set, 30-60 minutes, then slice into dials when ready to cook with. Serve on steak, burgers, or veggies and enjoy!